When you hear the word “Chow Fun”, you would probably think that this shop is selling fried rice. No, the name Chow Fun is in cantonese and it means fried noodle. 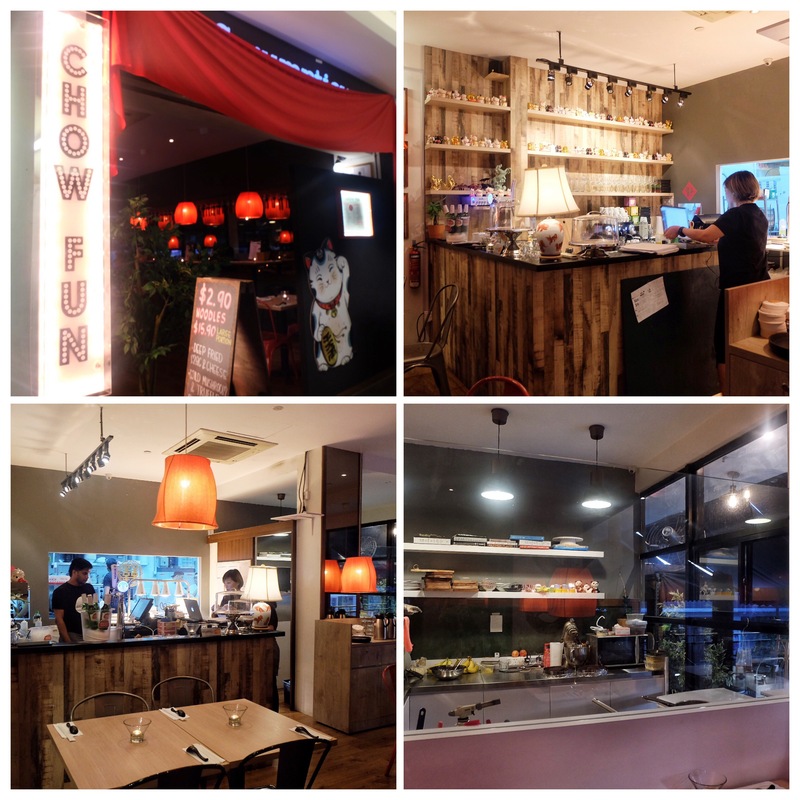 Chow Fun has come out with over 18 Asian and Western-inspired noodle small plates . moreish snacks and happy hour offer. Homemade Mom’s White Radish Cake [$5.90] Pan fried cubes of silky white radish cake studded with chinese sausages, dried shrimp , shallots and served with dried shrimp sambal. Not too bad for a starter! Potato,Bonito and Cheese Pancake [$5.90] A combination of melted mozzarella, mature cheddar and Grana Padano Cheese topped with thinly sliced crisp-fried potatoes sprinted with bonito flakes and spring onion. This is tasty but a little oily. 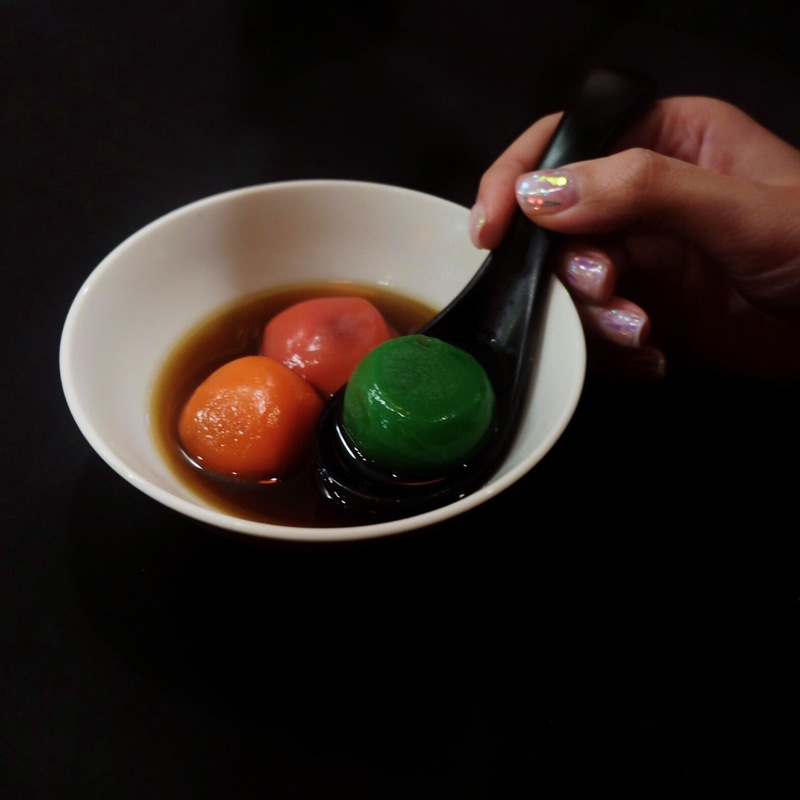 Fish Roe Fish balls[$6.90] Take a bite and let the fish roe burst in your mouth! SHIOK! Oodles of Noodles [$2.90 each] Over 18 Asian and Western-Inspired noodle small plates for you to choose! This is good for glutton like as I can get to try all dishes at a smaller portion. At a price of $15.90, you can also “upsize” your dish if you love it! Wild Mushroom and Truffle Must Try! Very rich and creamy pasta yet not jelat! Mixed with generous amount of shiitake and dried porcini mushrooms and accentuated with truffle oil, this dish is definitely one of my favourite dishes! Cold rice noodles tossed with ginger and scallion and mixed with finely chopped spring onions and ginger,vinegar, sesame oil and mirin. If you are a lover of these vegetables, you would love this! Tom Yum Cream Must Try! Udon is used for this dish, mixed with tom yum paste, sautéed mushrooms, cherry tomatoes, prawns and crispy chicken skin. Tom Yum paste is light hence not so jelat. The crispy chicken skin is the highlight of this dish, very crispy!!! Inspired by singaporean breakfast economical bee hoon, this fried vermicelli is soaked in a savoury dashi broth , topped with omelette and pickled green chilli. This dish is tasty, but the broth is a little too salty for my liking. Pineapple Fried Noodle Must Try! Inspired by KL hokkien mee, udon is used to slicked in dark sweet sauce and mirin, with pineapples to give a refreshing taste and homemade dried shrimp sambal to add in some spice ! Al dente spaghetti peppered with garlic, lemon zest with parmigiana -reggiano cheese topped with roasted bone marrow . Singapore Kelong farmed fresh shrimp cooked in white wine and tomato , then blended with a torch of cream to render a robust and briny seafood flavour. Prawn meat is stick to the shells, i wonder if the shrimp is really fresh? Other than that, this dish is not too bad. Pork Belly Bibim Guksu Must Try! Cold noodle dish with red pepper powder, gochujang ( korean red pepper paste) and kimchi (spicy pickled cabbage) among other ingredients. Comes wth tomato , egg and sautéed soy ginger-glazed pork belly , this dish is so yum! Lychee Granita and Crystal Jelly[$4.90] Must Try! VERY REFRESHING! Lychee syrup-infused shaved ice sprinkled with diamonds of ambrosial rose-scented jelly ! Homemade Tang Yuan [$6.90] Red Bean,Black Sesame and peanut tang yuan served in sweet ginger soup! I like that the ginger soup is sweet rather than spicy so this dish is just right for me! YES! 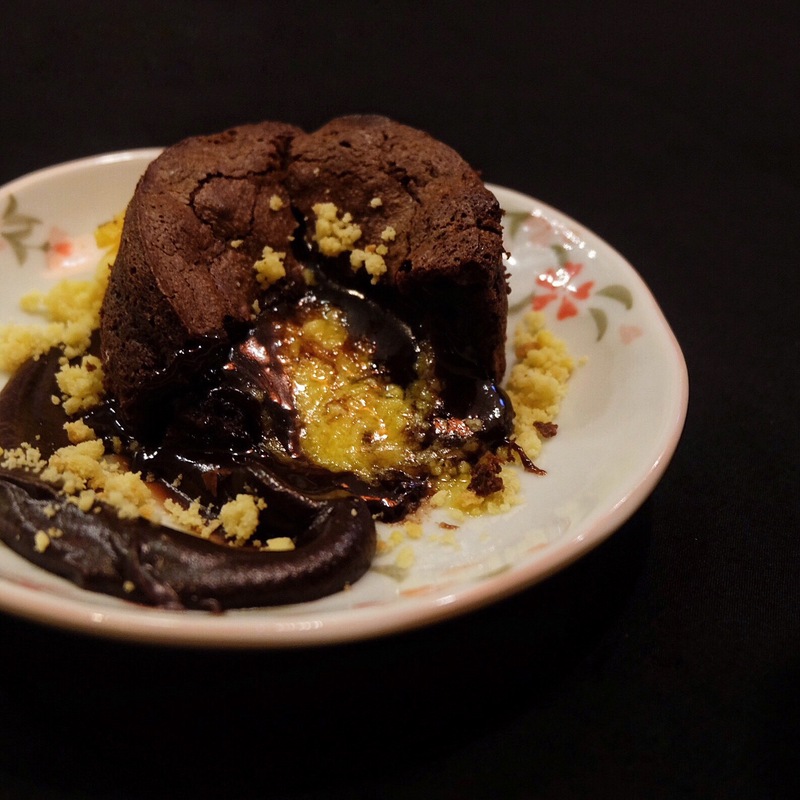 Salted egg lava cake for only $8.90! Where to find right ! Forget about the calories for the time being! 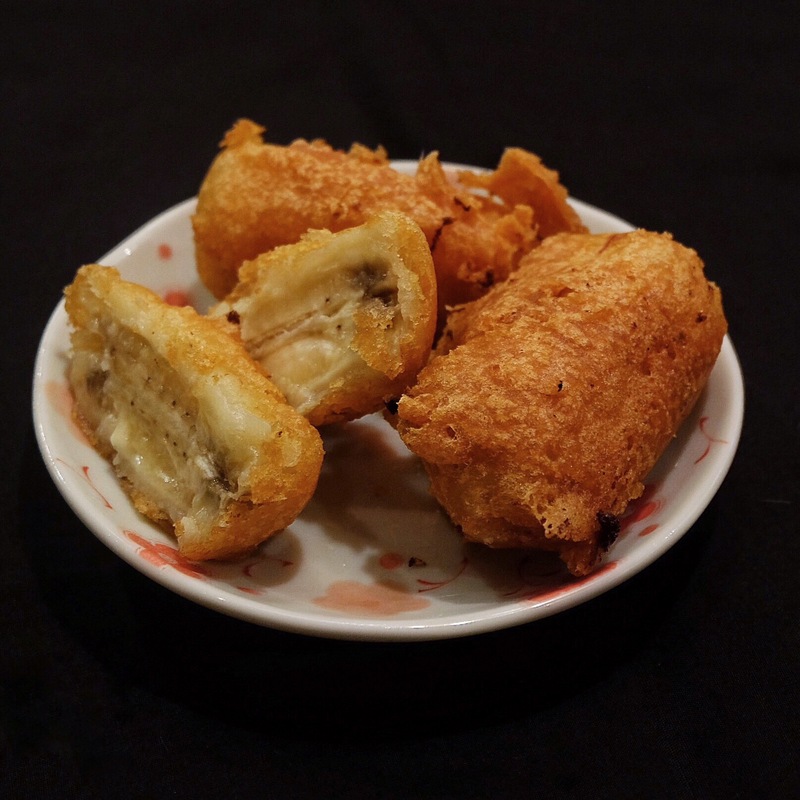 Deep Fried Caramelised Banana Fritters[$6.90] Caramelised banana coated with tasty batter. Very crispy on the outer layer and it remains crispy even after some time! Wine Lovers can sip on house pour Pierre Jean wines [$10 per glass|$56 per bottle]; or choose from more premium options such as the Montes Classic [$14 per glass|$62 per bottle] or Santa Rita [$16 per glass|$72 per bottle].